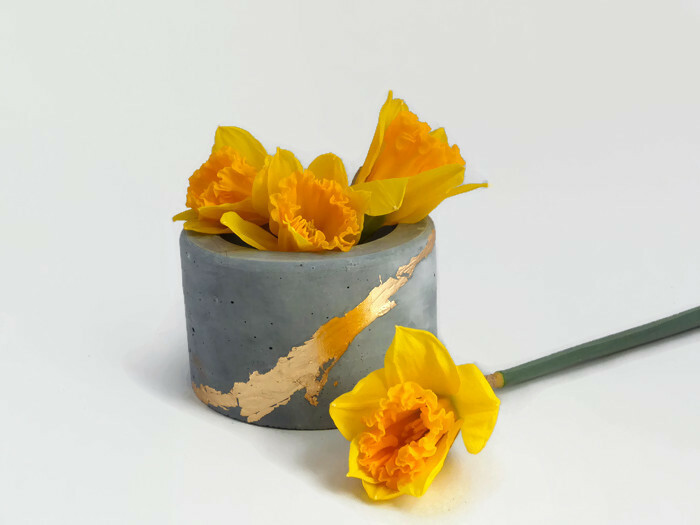 This dark grey and gold pot has been uniquely created out of pigmented concrete and finished with a gold leaf accent. It has been lovingly finished with a gloss sealer and cork base to protect your surfaces. It would look amazing with a cactus or flowers in, or can be used as a useful storage pot. It is approximately 6cm tall by 9cm diameter. My name is Gemma, the face and name behind Gem’s Concrete Gems, based in Reading, U.K. I am passionate about making concrete beautiful, and bringing it into the home. I enjoy the process of taking the same stuff that the ugliest buildings are made of and making it into something comforting, stylish and modern. Concrete is so much more versatile than people think and I am constantly amazed at what I can make with it. My products are mainly small pieces, clocks, candles, coasters etc., which will look great in any home. The industrial texture and look of my work complements the modern urban home, but also provides a stylish feature to more traditional houses as well. The time I need to prepare an order for shipping varies. Generally: Ready to ship items will be shipped within 1-3 working days. Personalised items will be shipped within 3-5 working days. Custom items take longer as the concrete needs time to cure and will generally take 2-3 weeks. For details, see individual items. Buyers are responsible for any customs and import taxes that may apply. I'm not responsible for delays due to customs. I gladly accept returns and exchanges if there is an issue with your item, if you contact me within 14 days of delivery and then ship items back within 30 days of delivery. I don't accept cancellations, but please contact me if you have any problems with your order. Because of the nature of these items, unless they arrive damaged or defective, I can't accept returns for: Custom or personalised orders Perishable products (like food or flowers) Digital downloads Intimate items (for health/hygiene reasons) Buyers are responsible for return shipping costs. If the item is not returned in its original condition, the buyer is responsible for any loss in value.